Kale: that funky looking leafy green that everyone is talking about. It is packed with vitamins and antioxidants to decrease inflammation in the body and boost your immune system. 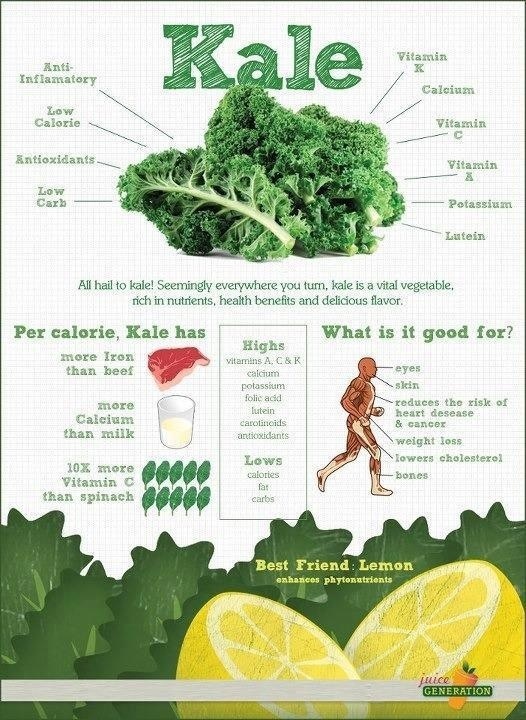 It has more calcium than milk, more vitamin C than spinach, more iron than beef, and more potassium than a banana. This tough leafy green comes out on top and it will make you feel great. Kale consumption actually feeds the body an essential amino acid necessary for serotonin production. 80% of the body's serotonin is produced in the gut, therefore feeding your body good foods like kale literally makes boosts overall sense of happiness and well-being. 1) Kale Juice - If you own a juicer, this is a great way to get everything out of your Kale. Juice with apple, beets, carrots, and lemon. If you don’t have a juicer (or if you are too busy/lazy to clean yours after you use it…no judgment that’s me as well), your neighborhood health food store will have all the green juice you need. 2) Kale Chips - This simple preparation will fill your desire for your mid-afternoon salty snack. Kids love them and you will too. 3) Kale Pasta - Add kale to your favorite pasta dish. Simply add it to the sauce the last few minutes of cooking and watch it soften. 4) Sautéed Kale - I like to sauté with garlic and onions in coconut oil before adding kale. Add Sriracha for a kick. Works great as a side dish or with some quinoa in a salad. 5) Kale Pesto Pizza - This is one of my favorite pizza recipes. I like it with caramelized onions and other veggies from the farmers market.